Step by step – painting a miniature dolls house painting using encaustic wax and heat tools. I thought it might be interesting to show how I painted this miniature dolls house piece of art. 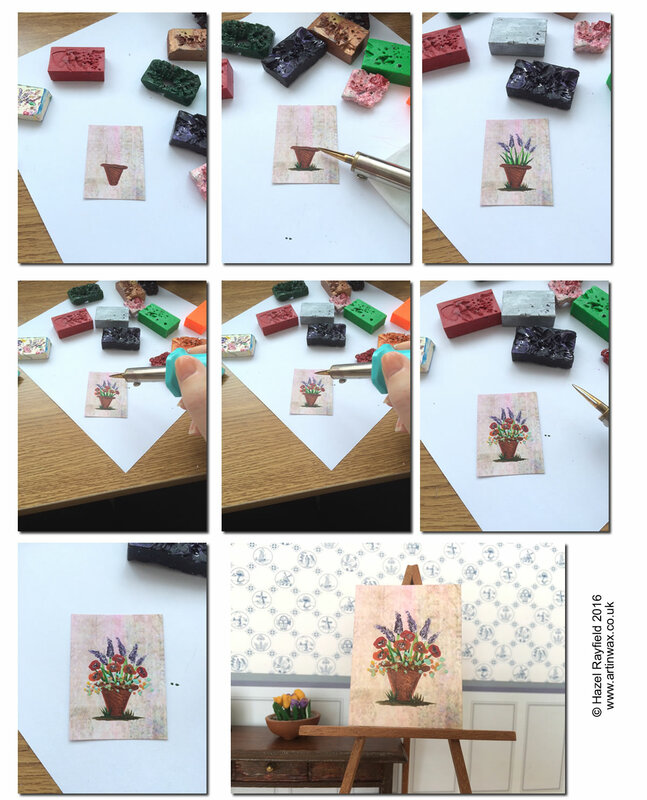 This painting is of a miniature flower pot and shows the stages of the painting. I am painting using a specialist heat tool called an encaustic stylus. Which I use to melt the encaustic wax and paint and blend with. The papers I am using as a support for this and the other miniatures shown in this post have an abstract design with a distressed styles, it is a Matt paper / card stock from a local craft supplier, the encaustic card I normally paint on is a gloss surface which allows the wax to move more freely. This Matt surface is a porous surface and when the wax is painted on it stays on, it can tricky working so small on this type of support as there is little room for error !! I used a mixture of brown, bronze and gold to paint the flower pot. Adding some grass to the bottom of the pot. Next using a mixture of purple and silver wax I paint the tiny lavender. Once finished the wax has a light polish with a soft cloth and I have backed this painting onto card stock to give a little more support to the painting. 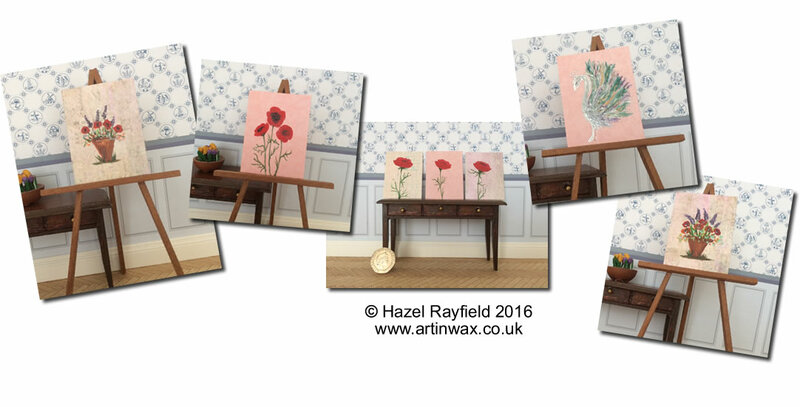 The paintings have a great texture and the wax paint has a lovely sheen which off set with the patterned paper background has a very striking effect. These miniatures would be great in a modern dolls house or contemporary miniature setting. Please note Art In Wax is for collectors and not a toy and not suitable for children.